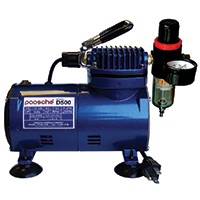 Size of the compressor: 11.2" x 6" x 9.8"
If you are looking for an airbrush compressor at a low price, take a look at Paasche D500SR model. The item is ideal for painting, airbrushing and other artist hobbies. What is great about this model is that it suits any airbrush and sprays properly thinned fluids. Hence, the paint will be spread on an object in even layers. 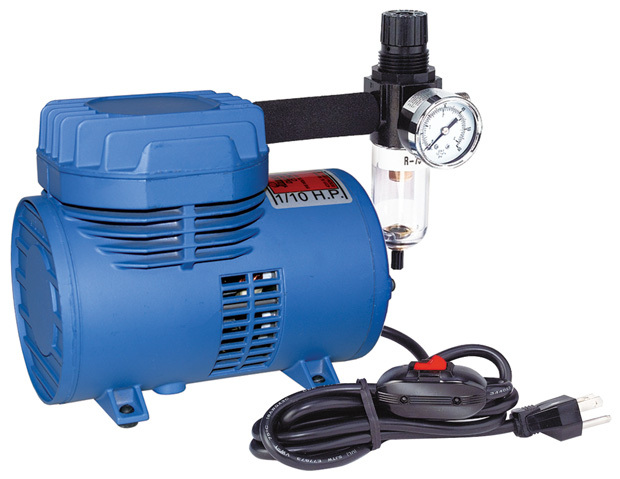 Moreover, the D500SR compressor features a regulator and a moisture trap. The regulator controls the pressure level and activates an auto shutoff function when the pressure is excessive. Besides, the auto shutoff operation turns the airbrush compressor off while you don't use the airbrush. The item will start working again as soon as the air flows through the airbrush. The moisture trap is needed to absorb humidity, otherwise, the undue damp will lead to corrosion and damage to the device. Other key features of the D500SR air compressor are portability and convenient carrying. Due to the compact size, the compressor can easily fit any desk or table. The carrying handle allows you to transport the compressor anywhere you go, and the ribbon cover grants a firm grip. What is also important, the item is quiet, providing only 47 Decibels, so you won’t get distracted by work of the device while painting. The Paasche D500SR is perfect for most airbrushes as it guarantees proper spraying of thinned fluid. It’s capable of delivering approximately 35 PSI operating pressure depending on the airbrush used. The ⅛ BPS adaptor allows using a variety of airbrushes including Iwata, Master, Grex, etc. 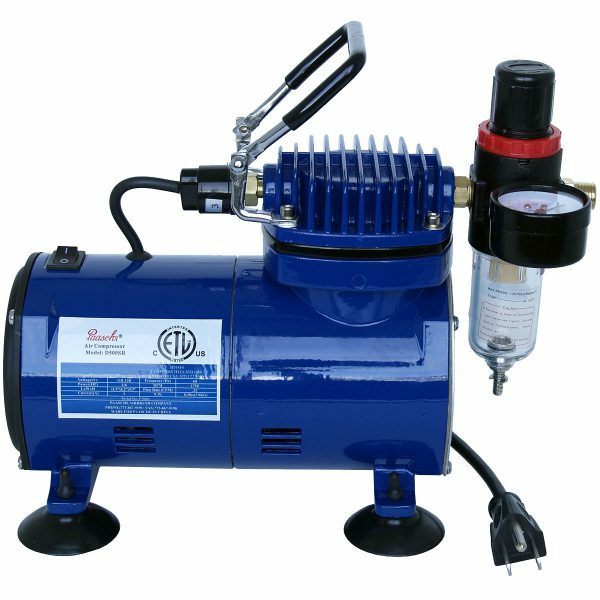 In other words, the compressor is suitable for many applications. Therefore, it can be used for a range of activities and hobbies. It’s silent air compressor that won’t disturb you while doing artwork so that you can pay all your attention to painting. The auto shutoff turns off the motor when the pressure level within the tank reaches its max value what helps not only to increase the service life of the compressor but also to protect the item from overheat. The regulator adjusts the pressure easily without sputtering. And finally, you can effortlessly assemble the air compressor and start working in a few moments.